First time in the history of a World Chess Championship match, fans world wide can follow the action on their Android devices! And not just follow, but immerse into it with this feature packed Android app! Follow the live moves on a beautiful Chess board, and watch as the drama unfolds in real-time! 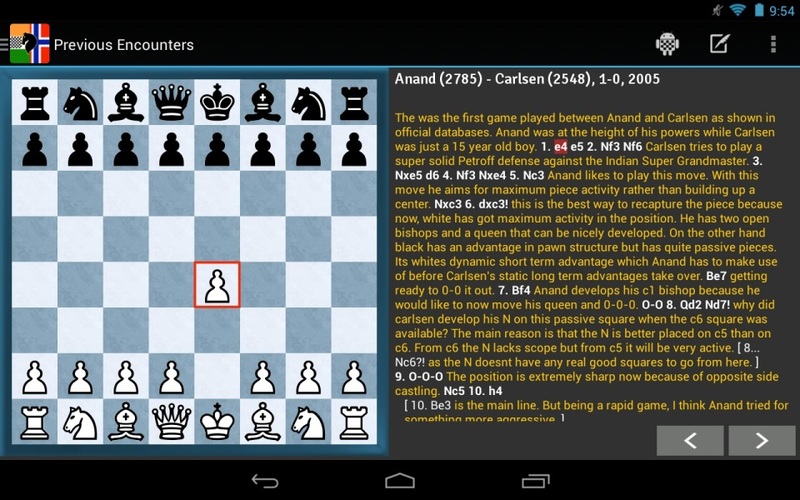 Get ready for the match as Sagar Shah (ELO 2373) walks you through some selected previous encounters of Anand and Carlsen, with some entertaining annotations and commentary. Solve 30 tactical puzzles of Anand and Carlsen (15 each), carefully selected by IM Swayams Mishra (ELO 2434). These are “awesome tactics worth solving”, as he puts it. Stay abreast with expert opinion and comments with the integrated Tweets. Also, Tweet while you watch the live moves right from the Board screen! Whom are you supporting? Choose either the “Cool Anand” or the “Hot Carlsen” board design and support your man! What if you could follow the action without even opening the app!!? Too good to be true? The home screen widget can be resized and made bigger! The app only only does its work when the server notifies it that a move has been made, instead of continuously connecting to the server every few minutes. This saves lot of device battery and you can always keep you data connection ON.